Although nature was never the subject of my work while living in Hawaii, since moving to New York City in 1983, all my work has been based on nature. My main inspiration comes from qualities of water, rock, earth, atmosphere, light, and vegetation that I remember from my childhood in Hawaii or that I now experience throughout the seasons in New York. My work is also informed by my love of Asian ink painting (in particular, Shitao, Fu Baoshi, and the Rinpa school), Middle-Eastern manuscript painting (in particular, the Safavid period), and European landscape painting (in particular, the works of Caspar David Friedrich, John Constable, and Emil Nolde). Three twentieth-century artists who have been especially important to me are Joan Mitchell, Willem de Kooning, and Richard Diebenkorn. I find it natural (and in fact necessary) to move back and forth between representation and abstraction in monotype and mixed media. Studying and depicting the forms, lines, rhythms, and atmosphere found in nature inform my abstract language. The processes and ideas that I continually develop doing my abstract work give me tools that I use when I return to representational work. Since 1992, I’ve worked exclusively on paper. I use archival papers with a wide range of fibers, colors, opacities, textures, weights, and methods of manufacture. In 2017, I began to make hand-made, one-of-a-kind books comprising eight related works. Sequencing the images is an exciting dimension for me. The fact that the images can be viewed and handled close up, without framing, in an intimate setting, is important to me. It brings the viewer closer to the way I experience my work myself. It is also in keeping with the Asian album painting and Middle-Eastern manuscript painting that I love. —a crumpled piece of heavy-weight piece of paper on which I’ve poured a watercolor wash; let the watercolor pool and dry in the crevices; and then flattened. Processes that involve chance, such as the last two described above, are particularly significant at this stage of my work as a means of suggesting imagery that I could not deliberately create. Once I begin to see where where the piece might be going, I develop it by painting and drawing, and often add irregularly shaped collage elements that relate to the imagery already created. —many tools (such as natural sponges, cotton swabs and balls, rubber spatulas, metal scrapers, plastic brushes, wooden shapers, knives, sand paper, brushes, liquid droppers, and air blowers). To affix an element to the substrate paper, I use acrylic matte medium. To create organic transitions between the elements’ edges and between the elements and the substrate, I use acrylic molding paste. The molding paste has considerable body, which I can use to add a variety of textures. To match the molding paste (which is white) to the surrounding areas and to further develop the piece, I use acrylic gouache. It works well for these purposes because it is matte (like the other media I use); its varying degrees of opacity allow for many different effects; and it can be applied in many impermeable layers. I may go through this sequence of steps (affixing/transitioning/developing) more than once in various areas of the work. Often, elements that seemed important in the beginning of a piece wind up completely covered by other elements or acrylic gouache. For many years, I worked on 30” x 22” substrates. In 2015, I started working in smaller formats: 22” x 15”, 15” x 11”, and 11” x 7-1/2”. The starting substrate for these is a rejected 30” x 22” work cut into two, four, or eight equal rectangles. After rotating each newly-formed substrate to the orientation where the randomly created imagery most intrigues me, I begin again as described above. Working in this scale while using the same tools and collage elements that I used for the larger works results in a greater prominence of texture, a spareness in composition, and a tendency toward bolder contrasts. My work generally evolves slowly over many sessions, and I sometimes return to works I started years earlier. In executing my work, there is a constant balance between precision and abandon as well as between moving the piece in a direction I see in my mind’s eye and being open to unexpected developments. I apply etching ink to a flat, rectangular metal plate using a wide variety of materials. When I am satisfied with the image I have created, I place a dampened sheet of paper over the plate then run it through an etching press. This transfers the ink to the paper. 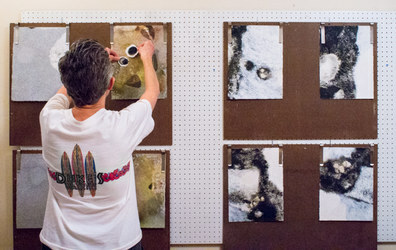 As only one image is created, the process is called monotype. I often work in series of a particular place: Hawaiian waterfalls, oceans, and mountains; Bear Creek in Ashland, Oregon; the peach tree shadows on our garden fence; Central Park ponds, lakes, and trees; Chinese Scholar Rocks; clouds seen in our neighborhood and in Holland. While the size of my press limits me to a maximum paper size of 23x12 inches, I sometimes make multiple-panel pieces to increase the scale and engage in more complex compositions. To learn how to make books, I took a course with Barbara Mauriello at the Center for Books Arts in New York City. We learned to make many different types of books using a variety of papers, book-fabrics and book-boards joined by folding, pasting, sewing, and taping. I chose the Chinese Accordion book format because the pages lie perfectly flat when it is opened as a traditional book. It can also be viewed as a folding screen, with the pages flared out around the spine like a star, or opened out flat showing all the images at once.